For a change of pace, and because I was running out of time, I decided to just complete my remaining 4 newborn cloth diapers in the green-and-blue starburst pattern for a total of 15 homemade newborn cloth diapers. I’m happy to report that those diapers are now done. Having exhausted my last spool of white thread, I did begin working with the cone, and I did have some trouble with breakage. Going to keep experimenting with it, but if the breaks become too cumbersome, I will just purchase one more spool of white thread. Ladies in laundromats who think they know everything about sewing and won’t stop touching your machine and trying to tell you what to do while you’re waiting for your clothes to dry are ANNOYING. Keeping your pins in your diaper and sewing over them = bad. Broke my first needle that way. Anyways, I’m getting sick of sewing these cloth diapers now. It definitely gets tiresome after about 30 diapers. Want to finish up this project soon so that I can move onto my next maternity project: sewing slipcovers in order to revive the cushions on my dirty, nasty rocker-glider that’s been sitting in the attic forever. 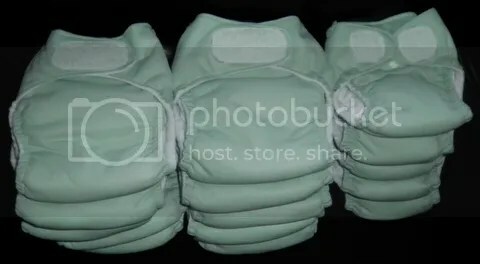 Altogether, I made 5 newborn mint-colored diapers and 10 one-size-fits-most mint-colored diapers. (The newborns actually still need their top “male” umbilical snap, but I’m going to wait until all of my newborn diapers are done to take those to my tailor and have those applied). Today I am 20 weeks pregnant. If all goes well, I am approximately halfway to holding baby Ivy or Constantine in my arms, and a mere 3-4 weeks away from the point where baby could potentially be saved if born premature. I continue to deal with my separation. Everyone I have talked to feels that I am doing the right thing given the circumstances. I have my up days and my down days. Husband says that he doesn’t want to lose me, but shows no interest in making the changes to his life that I’ve asked him to make. I’ve reached the sad conclusion that he doesn’t love me anymore. He says he does, and I have no doubt that he has strong feelings for me, but he is completely uninterested in translating those feelings into action. And that isn’t love. I just keep trying to think positive and visualize. Me, my daughter, my baby, the job I want to have, making a daycare routine work, living in a clean and uncluttered apartment. I’m going to make it happen. Left: Newborn diaper made with Darling Diapers free newborn pattern. Right: One-Size-Fits-Most cloth diaper made with the pattern found in Jennifer C. Berry’s book. I taught myself how to use the sewing machine a day or two ago. It involved sitting down and reading the instruction booklet. I’ve worked with sewing machines before, but only with an experienced seamstress looking over my shoulder, and only on the machines of others, so if anything happened (machine got stuck, needle bent, etc. ), I could always go running to my master. This time I was all on my own. The hardest part was winding the bobbin. The instructions on this were somewhat confusing and it took me a few tries to get it winding around the spool instead of winding around part of the machine. But once I got it, it was easy. I only had a few actual hang-ups when using the machine today (for example, my thread broke once). The machine was able to go through the thickest multiple layers of fabric without any problem. I was pleased. I made lots of small errors in craftsmanship which I’m sure I’ll get better at as I practice this, but none was significant enough to ruin my diapers. They should be functional. I started out by making the one-size-fits-most diaper found in Jennifer C. Berry’s book, then applied that method to the Darling Diapers free newborn pattern to make the newborn diaper. Since I’m quite the sewing novice and don’t even own a sewing machine, step 1 on the road to making cloth diapers was to get something that would tell me where the hell to even begin. Based on good reviews at Amazon.com, I picked up How to Make (All-in-One, One-Size-Fits-Most) Cloth Diapers by Jennifer C. Berry (Self-Published: Q. Berry Books, 2011). The Kindle version can be purchased for a mere $4.99, but I went ahead and purchased the paperback version for $16.99. I figured, because I’m a sewing dumbass, I would need to have it open on my sewing table and refer back to it frequently, and that’s just easier to do in paper than on a Kindle. I can’t really review the book until I’ve actually tried following its instructions for making cloth diapers, but so far I think it’s great. I read through it a few times today and feel like I now have a clear picture in my head of just how the heck these diapers are put together. I’ll conduct a fuller review of the book once I’ve actually used it to construct diapers.